Standing Bear was a chieftain of the Ponca Indian tribe, which farmed and hunted peacefully along the Niobrara River in northeastern Nebraska. 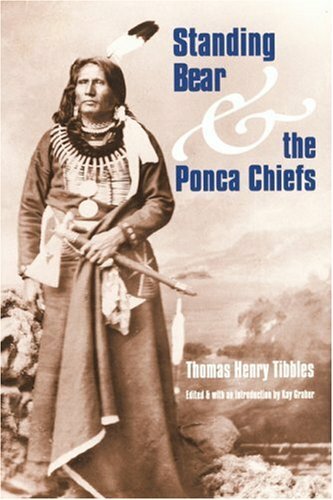 In 1878 the Poncas were forced by the federal government to move to Indian Territory. During the year they were driven out, 158 out of 730 died, including Standing Bear's young son, who had begged to be buried on the Niobrara. Early in 1879 the chief, accompanied by a small band, defied the federal government by returning to the ancestral home with the boy's body. At the end of ten weeks of walking through winter cold, they were arrested. However, General George Crook, touched by their "pitiable condition," turned for help to Thomas H. Tibbles, a crusading newspaperman on the "Omaha Daily Herald," who rallied public support. Citing the Fourteenth Amendment, Standing Bear brought suit against the federal government. The resulting trial first established Indians as persons within the meaning of the law. At the end of his testimony, Standing Bear held out his hand to the judge and pleaded for recognition of his humanity: "My hand is not the color of yours, but if I pierce it, I shall feel pain. If you pierce your hand, you also feel pain. The blood that will flow from mine will be of the same color as yours. I am a man. The same God made us both.